Smalley is the market leader in the industrial ring and wave/compression spring manufacturing business. We supply the aerospace, automotive and other industrial markets. Smalley Steel Ring Company is a privately held, family owned business with a positive, team oriented culture. Our organization focuses on quality, integrity, precision and reliability. Smalley offers opportunities both in the office and manufacturing floor. Our team in the office ranges from engineering, accounting, IT, customer service, purchasing, among many others! If you’re interested in manufacturing, CNC, distribution, machining, etc., our manufacturing floor is the right spot for you. Check out our open positions, and if you don’t see one that’s a good fit, submit your resume to our Talent Network and we’ll notify you when a position opens! 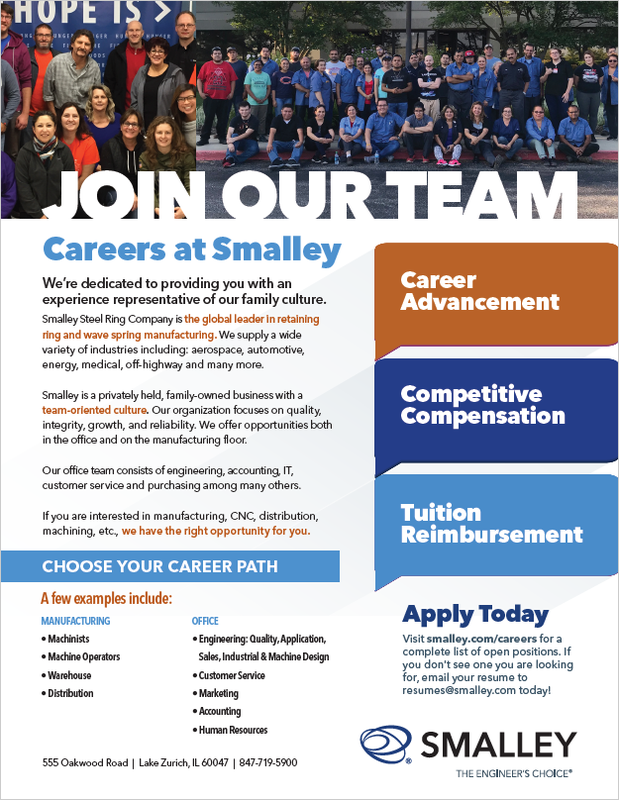 First and foremost, Smalley offers a competitive compensation and benefits package including: competitive base salary, 401(K) savings plan with company match, profit sharing, bonus, health, dental, vision, critical illness, company paid life, STD and LTD, supplemental life insurance, tuition reimbursement, paid time off and 10 company paid holidays. Smalley is a team-oriented work place with the opportunity for career advancement. But, don’t take our word for it. Check out the videos to your right and hear what our employees are saying for themselves. Smalley is dedicated to providing each candidate with an experience that represents the family culture and respect you’d feel as an employee. Once you’ve submitted your resume, it will be reviewed by our talent team. You will receive a confirmation email that we’ve received your resume, and updates including if the position has been filled. If you’re qualifications are a match for the opportunity, we’ll reach out to set up a phone interview to learn more about you, and share more about Smalley. If both parties agree there is good potential, you’ll be invited in for an in person interview to meet with a member of our talent team, the hiring manager, and potentially some team members! We’ll work with you throughout the process, answering any questions you may have. Looking for a position that is not posted? Join our Talent Network to receive alerts about new job opportunities that match your interests.